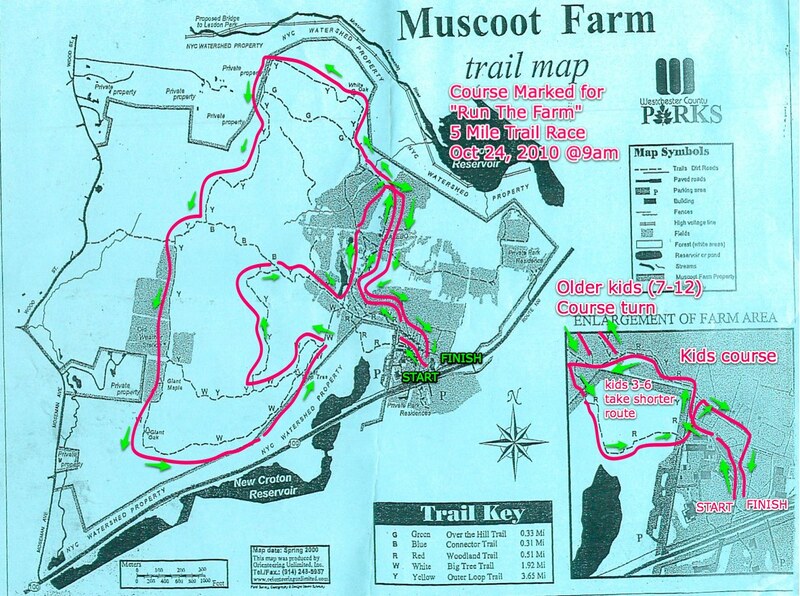 For directions to Muscoot Farm, click here. The course passes through farm roads, forests, meadows, along steep hills, and over stone walls. There are some small seasonal streams and one wooden bridge. There are no large stream crossings. The two largest hills are at the one mile and the three mile marks. The hill at the one mile mark is long but not overly steep. The hill at the three mile mark is a quarter mile long and starts out steep and gets steeper towards the top of the hill. Depending on the weather for prior days and weeks and the season of the year, some of the course may be wet and muddy but most of the course is well drained. The course starts at the gate to the farm road near the chicken enclosure (close to Route 100) and travels between the buildings housing the farm’s animals (chickens and goats on the left, then turkeys on the right). The course goes up the hill and passes the Muscoot Gazebo on the left (the half mile mark outbound and 4.5 mile mark inbound) then leaves the farm road for a meadow trail (yellow trail) which goes into the woods on single track after about 0.2 miles on the meadow. The course follows the yellow perimeter trail on single track for just under two miles going north, west, then south. The course continues on the yellow trail until it intersects with the white trail near the end of the second set of fields (bear right onto white). The course then follows the white trail up the cliff edge and makes a sharp left turn back up the hill onto the yellow+white combined trail at the 3 mile mark. After this the course follows the trail up the hill (0.25 mile sharp climb) and makes a right onto the yellow trail. The trail descends steadily then intersects with the farm road again. Follow the rough farm road over a set of boardwalks until you pass the pond on your left. Take the left turn after the pond and pass by a dock platform with a bench. At the “Pumpkin Meadow” keep going straight into the meadow and stay to the right side of the field. Rejoin the yellow trail at the end of the meadow and turn right over the stone wall and then follow up the hill back towards the Gazebo. Pass the gazebo (4.5 mile mark) and head down the farm roads (same ones you came out on) until you start to see the paddocks and farm buildings. Bear left past the horse barns to find the finish chutes next to the duck enclosure. Click to download pdf version. Thanks to Lee Willett for creating the new map! 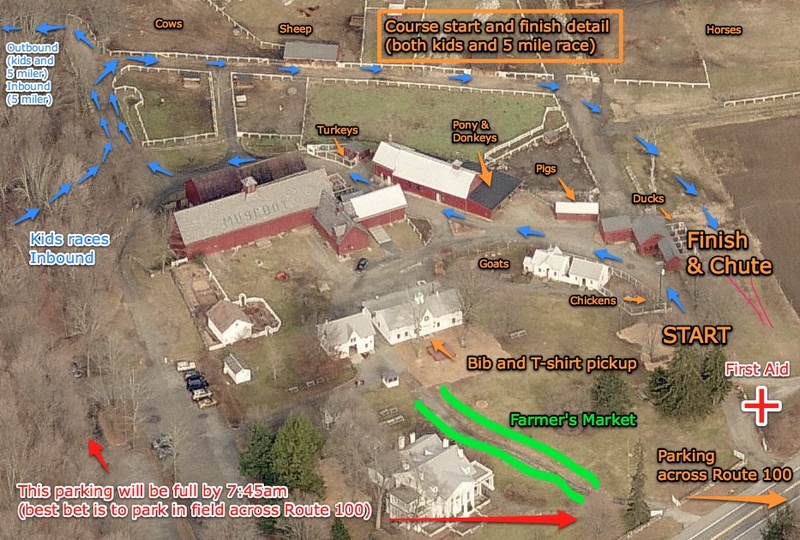 Click map to view larger image with Run The Farm course overlaid (2 kids courses also added in lower right callout). Each finisher in the 5 mile race will be given $5 in “Farm Bucks“ as they cross the finish line. Finishers in the “Kids Run The Farm” race will be given $2 in Farm Bucks. The runner can use the Farm Bucks certificates with the farmers in the market on the day of the race. At the end of the market, the farmers will turn in their farm bucks for cash from the race organizers. The intent is to encourage all runners and their families to visit the market to see if there is anything of interest to buy.